NEW DELHI- India on Friday, October 17, 2014 successfully test fired its home-made, nuclear capable sub-sonic cruise missile, Nirbhay, from a test range in the eastern state of Odisha, sources said. “The test firing of the surface-to-surface missile from the integrated test range at Chandipur around 10 a.m. (local time) has been successful,” the sources said. Local TV channels showed footage of the missile blasting off like a rocket, and then, unlike a missile, turning into an aircraft with wings and pronounced tail fins. The missile, developed by the state-owned Defense Research and Development Organization can fly at tree-top level, making it undetectable on radar, the sources said. With a strike range of 1,000 km (621.37 miles), it can hit deep into enemy territory and it has a fire-and-forget system that cannot be jammed. When India’s own satellite navigation fleet is ready, cruise missiles can be controlled by signals from the country’s space system, the sources added. The maiden test firing of Nirbhay (meaning fearless) was not successful in March last year as it deviated from its course about 20 minutes after launch. 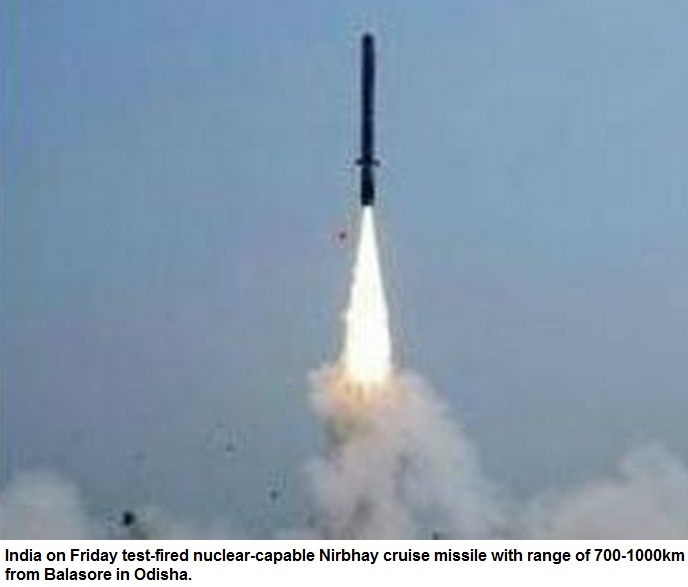 Nirbhay is India’s equivalent of America’s Tomahawk and Pakistan’s Babur missiles.